Why would we choose to build a custom home over buying a preexisting home and why have K&K Homes build it for us? The term “Custom Home” sounds expensive to some people. However, in reality, K&K Homes can build you a custom home for the same or less than you can buy a preexisting home and in the end, you get the exact home you have always wanted. Kevin and Kelvin set down with you and take the time to find out exactly what you want in your new home, therefore, you are not paying for features in a home that you do not want. For example, we have some customers that do not want solid surface countertops and choose to spend those savings somewhere else or keep it. 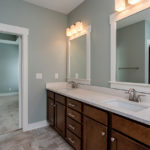 You may not want a Jet tub in the Master Bath and spend that money on upgrading your kitchen cabinetry or appliances. You may want a bigger garage so you have room for your extra vehicle or other interests. You may choose to finish that family room in the basement later and save some money. By building a custom home, with K&K Homes, YOU get to choose the location where your family is going to be living, for the next several years. K&K Homes has access to several lots in many different communities, including but not limited to Des Moines, Pleasant Hill, Altoona, Johnston, Ankeny, Grimes, Carlisle, Waukee, Grimes, Norwalk, West Des Moines, and Urbandale. As custom home builders, we are able to, in most instances, buy these lots at reduced prices, and pass these savings on to you. On the other hand, you may already have a lot; we can build on that also. Why would K&K Homes be a good choice for my custom home builder? We tell our future homeowners that building a custom home should be an exciting and fun process. This may be the biggest investment you will make in your lifetime and you should get exactly what you want. Kevin and Kelvin make this their goal with every homebuyer that they work with and in the end; we are sure you will be happy and satisfied with your new home. If you call K&K Homes on the phone, you will talk to either Kevin Yoakum or Kelvin Langmaid, not a Secretary or Superintendent. We are the ones that visit the job sites daily and make sure the quality of your new home is what you expect. We have several floor plans to choose from or we can build a plan of your choosing. Give us a call or send us an email on our “Contact Us Page “and we can set up a time to set down with you and start making your dream home a reality.